Home / Featured Articles / Does Paranormal Unity Exist? The Truth Revealed!! Does Paranormal Unity Exist? The Truth Revealed!! We asked the community the question, and this is the response! Why do people say they support paranormal unity or believe in paranormal unity? Its a way to gain more followers and grow your own brand by trying to unify with bigger groups and teams. splitting hire charges of events, so its cheaper to investigate without public. To learn new methods and get new ideas. Why Paranormal Unity Doesn’t Work..
Money / Price of events. People get upset when their idea’s are Copied. Paranormal unity in a big scale doesn’t exist. and it rarely ever lasts when there is a large chain of groups all within a unity bond. However paranormal unity does exist in small circles. a few teams thinking they are doing good and sharing all their knowledge and resources which is good. but even these bonds are bound to brake at some point.. there is that saying… nothing lasts forever and as much as i am a barer of bad news its how i feel with it all, honestly. The more groups within a chain of unity the more unstable it will be. in my opinion. it just takes one person to disagree and cause a massive split in the bond. 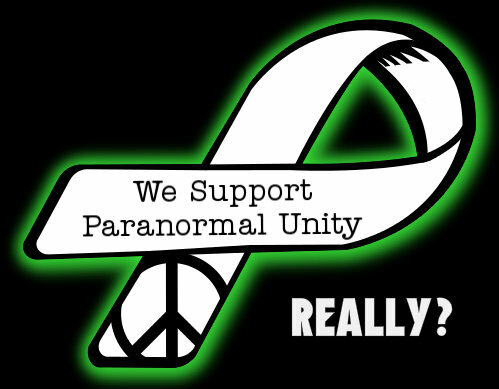 Paranormal unity WORKS WHEN IT WANTS TO WORK. This is a rare situation which doesn’t happen often where HEEPS of teams and companys come together for a pacific cause or agenda for a short while when something drastic has happened in the field. like a Money Con, or vandalism of a venue, Or Robbing of people’s gear. So all people who dont get along, put their differences aside for this sole purpose to try and right a wrong. Which is very nice to see happen and does happen from time to time. But sometimes everything is not what it seems.. always listen to both sides of the story before taking a side. or even better. TAKE NO SIDE, but your own. Here is the results of the poll. Previous post: The Feeling of Been Watched – Is It Paranormal? COOL FACT.